Save Money on Your Power Bill! your power and create a healthier living and working environment. – Plugs into any standard 120v outlet. – Reduces EMF, filters and reduces dirty electricity. – All outlets on the circuit are surge protected with the Pure Power Plug-In. – Reduces power costs for common appliances, refrigerators, freezers, air conditioners. – Protects and prolongs the life of equipment and appliances, cooler equipment, longer lifetime. – Built-in outlet for plug-through convenience. power of an entire home less than 3,000 square feet or a small business office. to ensure both quality and safety nationally and internationally. else on the market at any price. As an EMF consultant and an authorized reseller of Satic products, I am happy to represent these excellent devices. Having installed the Satic Pure Power Plug-Ins into my solar powered, off grid home I am very satisfied with the results. Off grid homes are known to be the worst situations for high dirty electricity!. The Satic Plug-Ins reduced the dirty electricity by over 50% on one circuit and even more in other portions of the home. This is a huge accomplishment compared to having to install more expensive equipment for dirty electricity reduction. If the Pure Power Plug-In can accomplish this reduction of dirty electricity in a solar powered home, it can easily and greatly reduce dirty electricity in a home or office on the grid. The Pure Power Plug-In utilizes the latest in energy management technology. Satic’s proprietary design, a combination of analog and digital technology. It is the result of existing wave-form correction and harmonics filtration methodologies by industry leaders. No other Energy Management System has this extraordinary combination of application specific circuit board design, optimized power conditioning, voltage regulation, nano-surge filtration, electromagnetic field and negative harmonics reduction and extremely robust surge protection. 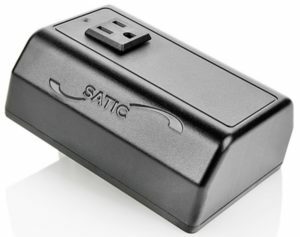 All packaged into Satic’s unique design, which allows it to be smaller, more affordable and more effective that anything else on the market today at any price. – How Many Pure Power Plug-Ins Do You Need? 2 Pure Power Plug-Ins will condition the power of an entire home, less than 3,000 square feet or a small business office. For more efficiency or larger homes, additional units may be used. Residential homes are wired in single phase electric power, which is then divided into Phase A and Phase B. The circuits follow the pattern A, B, A, B in the breaker box. These will be labeled for specific rooms or appliances in your house, in case you ‘pop a breaker’ and need to flip the breaker switch to turn the power back on. For example, if your refrigerator is on a breaker labeled Phase B and your guest bedroom is on a Phase A breaker, simply plug one Pure Power Plug-In into the same outlet in the guest room. As long as there is one Pure Power Plug-In placed in each of these split phases, your whole house will be covered! In regards to dirty electricity reduction, unless you have a Stetzerizer Meter or Greenwave EMI Meter (available in my ebay store), you will not be able to measure the reduction visually.